Hiya guys! It's Thursday already and seriously where did the week go? Not that I'm complaining about work being over, but I'm just surprised. Not as surprised as my husband was when I asked him to participate in the He Picks My Polish Challenge again. This was probably the most involved he has ever been since the first time we did this challenge and it was very funny to watch his thought process. He must of changed his mind a million times and kept changing up the colors... ah yes, welcome to the mind of a polish girl. What do you guys think? The only thing I wish is that he would of gone with a different color scheme since I do a lot of red and black manis. But I think that's exactly why he chose the colors, he knows they're my favorite to work with. The process of watching Austin pick out the polishes was fantastic. The man had a vision and knew exactly what he wanted... he just had a hard time finding it through 5 helmers full of polish. 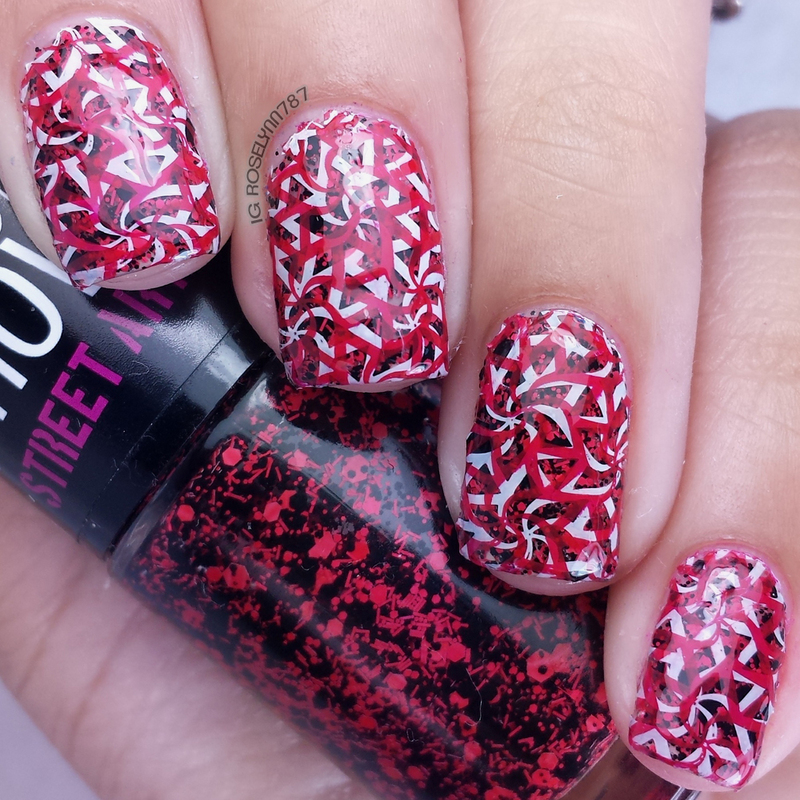 The base - Wild at Heart - is a red and black glitter topper that I ended up layering a bit for a full finish. He also picked out the stamping plate, but kindly let me pick the pattern from the plate. After seeing my double-stamping tweed design, he wanted me to do something similar. I have to give my guy credit, he picked some really good polishes out and I like how it turned out. I had a lot of fun joining in on this challenge after not doing it for quite some time. Not sure if I will be doing it every month, but I will definitely have to remember to do it again soon. Don't forget to check out the other ladies participating in this challenge with the awesome guys in their lives. That is super involved! I can't believe anyone can do this on their own. Good job! Wow, that's neat! Maaaaybe I can get my man to be this involved sometime, lol :D. Love how this came out! Thanks a lot. You totally should join in on the fun. After hearing us talk about polish so much they are bound to pick up a few things. That is just mind boggling to me. I have a hard enough time putting on a solid coat. I think it's amazing, though! Thanks! I will definitely shoot a video showing how simple it is to stamp and that way maybe you can try it out sometime. Wow! Love this. I love cool patterns like this. Very cool. I wish I spent more time on my nails because this sort of thing I would love to try! Thanks so much. If you ever catch yourself having the time, you should definitely try something like this out. It's a lot of fun. This is VERY interesting! I like it but do not have the patience to do my own nails like that!! Thanks. I don't have patience for much besides nail art lol. Thanks. It's really a great way for a little husband and wife bonding without having to nag him lol. Yeah he really thought hard about this one. But trust me he was clueless the very first time I asked him, picked some god awful combination I was so mad about lol. I'm loving these colors. He did a great job picking the colors. I think this came out really great. I actually like the color scheme. It all makes it pop and look so deep and squishy. That's such a pretty pattern. It almost reminds be of the UK flag. I think the colors you picked were perfect. Oh my gosh, I love how this turned out! I think he did a great job, maybe one of these days I'll to the He Picks My Polish challenge! Such a cute idea - I've got to try this sometime!! Can I call you the nail polish fairy? I have never seen so many styles and design in anail but here in your blog! I love your nails. The color looks great. I would do my nails like this . I love to wear polish. Austin did good!! I freaking love this so much! Thanks! He's so psyched about the reaction it has gotten lol. That is a very nice pattern you've got going on. I wonder if my wife knows about this challenge. She may want to participate herself! I love this! 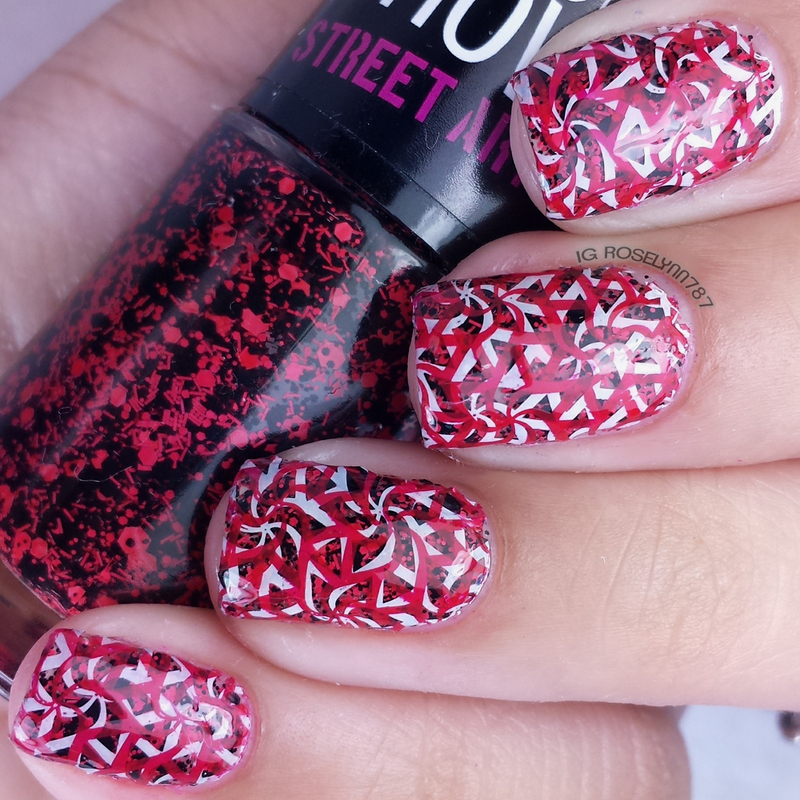 I'm a sucker for black, white, and red and the double stamping over glitter is brilliant. I am absolutely in love with these nails. I would feel like a rockstar with them. They look so vibrant and beautiful, I seriously love how much they stand out; these colors actually go so well together! Oh wow. I think your nails look gorgeous. I love the red, black and white. So beautiful. Your husband made a good choice. Wow, your nails look absolutely stunning! I wish I could do nail art like that and not have it end up looking messy. Thank you, I always think red compliments my skintone so well. Your nails look stunning, you must be a professional at this?! I honestly dont think mine would ever come out like that. Oh no, not a professional in the slightest bit this is all just a hobby. OMG wow!! I really love those colors! It's neat to see the combination of them! Hokey smokes, that's divine. I love how they turned out. I wonder if I could do that myself over here! That looks amazing. if I had asked my husband to pick out a color he would have laughed at me. :) Great work! That's super awesome that your hub did this! I love the patterns. I have NEVER seen anything like tHIS! That is such an awesome look. The colors are cool. As soon as I seen this on Facebook I loved it! This is some serious nail art. Wow! What a great job!! Your nails are pretty and unique! I don't even want to know what color my husband would choose if he had to choose my nail polish! I know that my nails wouldn't look like yours though! Beautiful! Oh wow – even though red is not one of my favorite colors, I really like this design. It's very interesting to look at. I think my sweetie would pick something plain and neutral (frown face). I'm not sure if I'd have the time or patience for nail art. However, your nails are always beautiful! What a cool challenge! I love the design. Very festive! This is all kinds of awesome. Love this! 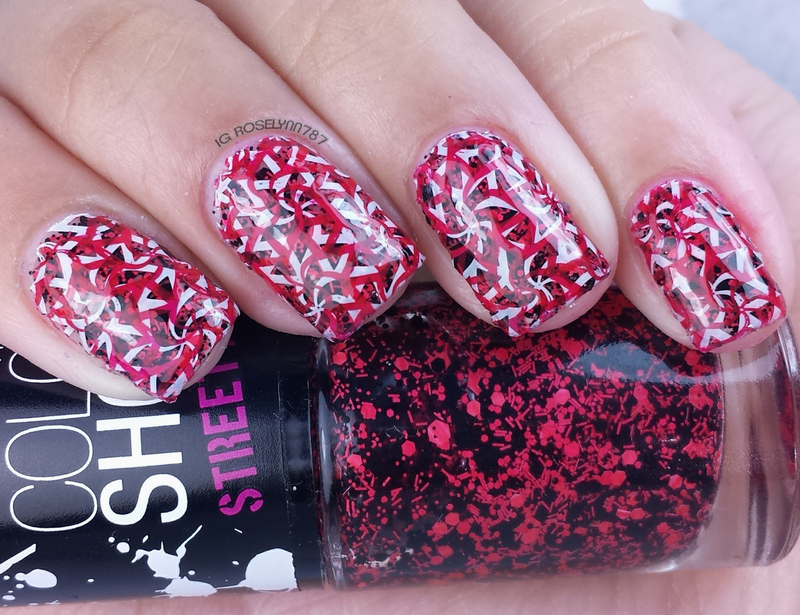 That is such a crazy fun nail polish! Looks like a lot of fun to apply and wear! Thanks for sharing. That is such a cool design! It almost looks as if someone laid down each layer one by one, but thankfully the polish did all the work lol.